On page 7 is a list of all the questions on the Google Form (shown without the blank fields to save space). Five years ago, we began an aggressive push to grow our program offerings at Mead Public Library in Sheboygan, Wis., as part of a larger effort to better engage our community and bring new people in the door. The results have been dramatic. During that span, we went from 500 events a year to more than 1,200, and enthusiasm for our efforts continues to run high in this 50,000-person Midwestern city, which is situated about halfway between Milwaukee and Green Bay. At our one large library, attendance last year neared 40,000 people for our expanded lecture offerings, workshops, makerspace programs, storytimes, after-hours activities, and other events. But to get to this point, our old way of planning programs had to evolve. This required fundamental changes for our event planners and for our modest one-person marketing department—me. Today, we plan events much earlier and enforce deadlines more strictly, and most important for me, we’ve streamlined and formalized our publicity-request process to ensure I have all of the information needed to market our programs on a timely basis, without burdening our staff with paperwork. Our current process for publicity requests now centers around a simple, easy-to-use online Google Form that staff members fill out once their programs are approved. That form contains all the information I need for marketing purposes. As a result, when I begin churning out event posters, fliers, social media posts, web images, newsletters, videos, and more, everything I need is in one place. In fact, it’s so efficient that we now use the same Google Form for evaluating programs, and we have created a separate one for printing requests for book display signs and other items that are unrelated to programming. Five years ago, when we launched our initiative to grow Mead’s program offerings, staff members would fill out a paper publicity-request form and hand-deliver it to our print shop. Or, at least they were supposed to. Too often, staffers did not use the form, or they left out key details regarding their programs. Worse yet, they treated deadlines as optional. Part of the problem was that our marketing deadlines were confusing, as there was one for our printed newsletter (which came out every 2 months), another for our monthly enewsletter, and yet another for posters, fliers, and other printed material. That led to publicity requests being made piecemeal, with some details submitted on paper, some in conversation, and others in email. Back then, it wasn’t difficult to keep track of things, even with somewhat sketchy information, because the number of programs Mead offered was a fraction of what it is today. But as we rapidly worked to increase our offerings, our old system didn’t cut it. We began overhauling our program-planning process by instituting a quarterly program calendar, in which all events would be planned on a quarterly basis for fall, winter, spring, and summer, and publicity requests were due 6 weeks before the start of a given quarter. We then moved our publicity-request form online by creating a custom survey in Google Forms, which is an easy-to-use survey tool that’s part of the Google Drive office suite, along with Google Docs, Sheets, Slides, and more. Mead’s IT department had already set up all staffers with Google accounts to make this sort of sharing possible. Initially, the biggest challenge with these changes came from getting staff members to plan programs much further in advance. This required everyone to think in a new way, to get better organized, and to unlearn some habits they had picked up over many years. To get everyone on board, we unveiled this new, mandatory process in person during meetings with our public services staffers—with the full support of our library director and management team. Early on, we made sure to provide regular reminders on the new process and deadlines to help guide people, and we worked individually with anyone who needed assistance with Google Forms. A major change like this needs ambassadors to help sell it, and we accomplished this by communicating the benefits to staff members: This new process would save them time on paperwork and would lead to better attendance, better programs, and a better library. As time went on, it became hard to argue with the results, because we ended up with more timely, well-thought-out, and well-executed promotion that resulted in better attendance. Very quickly, the heavy lifting involved with doubling the number of programs we offered was validated by seeing full classes and waiting lists for many of our offerings. The technology is free, intuitive, customizable, and extremely easy to use. I can continually update and refine the form without having to print and distribute a new version. Google Forms allows users to require that certain fields be completed, which means people filling out the forms don’t have the option of leaving out critical details. This saves me from chasing down staffers for missing details about upcoming events and losing precious time doing so. Once you create the Google Form, you can share it with anyone on your staff. They can easily access it when logging in to Google Drive. There’s no paper form to track down or misplace, and thus, there’s no reason to not use it. I set up our system so that when a form is completed, it’s automatically sent to my email and stored on Google Drive, so it can’t be misplaced or lost in transit. You can also set it up so the form is emailed to managers and others once it’s submitted. We’ve worked hard to keep the form as simple as possible and to only include what’s needed. Our form incorporates a mix of multiple choice, short-answer, and paragraph questions. It requires staff members to submit a program title, date, and start/end time, along with the room location and a brief description. Staffers also have the option to indicate whether the program is restricted to a certain age group (such as kids or teens), whether it requires advance registration, and whether outside organizations need credit on any publicity I create. They can also include links to websites, photos, headshots, and more, when needed. We haven’t yet included social media requests on our forms as I feel that the options are too varied and complex, and most staffers don’t understand the available strategies well enough to make those decisions. For example, I don’t expect employees to know which social platforms are best-suited for their programs and intended audiences—or whether a Facebook Event would be beneficial or if a simple post would suffice. At this point, I formulate a social strategy for each program on my own. 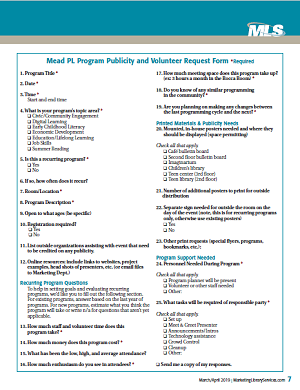 Our library has also begun using Project Outcome to evaluate our programs, thus our publicity-request form requires everyone to categorize each program into one of the seven Project Outcome topic categories we use: civic/community engagement, digital learning, early childhood literacy, economic development, education/lifelong learning, job skills, and summer reading. Back when we started this process, we initially required staffers to enter the details of their proposed events into a spreadsheet shared on Google Drive, and then our program-planning committee members would review the spreadsheet and give a thumbs up or thumbs down to each proposal. Once a program was approved, the planner would fill out the online publicity request. That approach proved to be somewhat burdensome for staffers, as they had to enter the same information in two places: the spreadsheet and the publicity-request form. Plus, it required multiple email exchanges to communicate which programs were approved and to answer any questions the committee members had. We’ve since eliminated the original spreadsheet, and we now have planners pitch their program proposals in person to the committee so we can provide more timely feedback and ask questions. That alone has eliminated countless emails, and it results in less paperwork for everyone. Now, if a program is approved, its planner only needs to enter all of the related information in one place. More recently, we’ve added a few post-event questions to our publicity-request form, which staffers fill out for recurring programs. (In some cases, they answer those questions for new programs, using estimates. This helps us set expectations and create goals.) These questions also include how much staff and volunteer time was required and how much money the program cost. In addition, we ask for the low, high, and average attendance numbers, along with the enthusiasm level that program planners observed in attendees. Our goal is to look beyond the gate count. If attendance is modest, but the participants are passionate, we want to know that. We also ask how much meeting space is used and for how long and whether there are similar programs elsewhere in our community. Finally, we ask whether changes are planned for future iterations of the program. After spending years building up our program offerings, we’ve now reached the point at which we can refine what we offer and apply lessons learned. These post-mortem questions are our starting point in identifying programs that might need freshening up, need a different marketing approach, or maybe need to be eliminated altogether. Finally, we’ve also incorporated calls for volunteer assistance into the publicity-request form. A copy is emailed to our volunteer coordinator, who then uses it to schedule volunteers to assist with our events. This has created additional efficiencies by eliminating more paperwork and emails for our employees. Our staff members have been very receptive to the online publicity-request form because it saves them time and helps guide their thinking when planning out programs. After several years, using the form has become routine. They know where to find it and what details need to be locked down by our publicity deadline. They know what my expectations are. The only remaining hurdle has been getting everyone to meet my deadline of having all requests completed 6 weeks before the start of a given quarter. Over time, I found that regular deadline reminders sent via email were not enough, nor were in-person conversations with our persistent procrastinators. After seeing too many deadlines missed and having our marketing efforts suffer as a result, this past fall we went with the “nuclear option” of deadline enforcement: If a publicity-request form is late, the program is canceled. Our public services manager suggested this nuclear option, and when our director heard the idea, he fully supported it. They felt we’d been too nice for too long with people who habitually didn’t follow the rules, and the problem was getting worse. To introduce and implement this new rule, we explained the policy in person and via email. There was plenty of grumbling and plenty of shock, but the only direct pushback came from the staffers who were planning the most programs. We concluded that our biggest problem was that an abundance of staff members were taking on too much responsibility for programming. We made it clear that while we expect them to organize programs, we don’t have quotas, and we fully support doing fewer programs and emphasizing quality over quantity. Now, my reminder emails carry more weight with the procrastinators, given the prospect of their programs being canceled. And I’m noticing that these individuals are submitting their forms soon after my reminder emails arrive, whereas in the past, many ignored my communications. We make some exceptions to the rule, especially for situations outside of the program planners’ control (such as presenters not returning calls), but otherwise it stands. It’s an extreme response, but as the saying goes, “Nothing gets done without deadlines.” We’ve now gone through two quarters with this rule in place, and no one has missed the deadline. And after enough time passes, complying will become routine, just as it has for the rest of our revamped marketing-request process. Josh Lintereur is the communications specialist at Mead Public Library in Sheboygan, Wis. He holds a master’s degree in journalism from the University of Oregon and a bachelor’s degree in business from the University of Minnesota. He worked as a newspaper reporter and editor for a decade before moving into a communications role at Mead, where he recently led a rebranding initiative and expanded the library’s digital footprint. His email address is joshua.lintereur@meadpl.org.